Well despite the fact there were a lot of drugs that needed to run their course, five hours was a bit too long. I explained to the nurse that I was a born multi-tasker and suggested we look at running some of these medications simultaneously. Although she wouldn’t agree to that, I did convince them to speed up the flow of the IV drip and we were able to knock the process out in just three hours! Once this was underway, I fired up the laptop so I could do some work, turned on the World Cup game (go Spain! ), and ordered in some food. So, how did it feel? Well, I hope I’m not reporting too prematurely, however thus far I feel great! 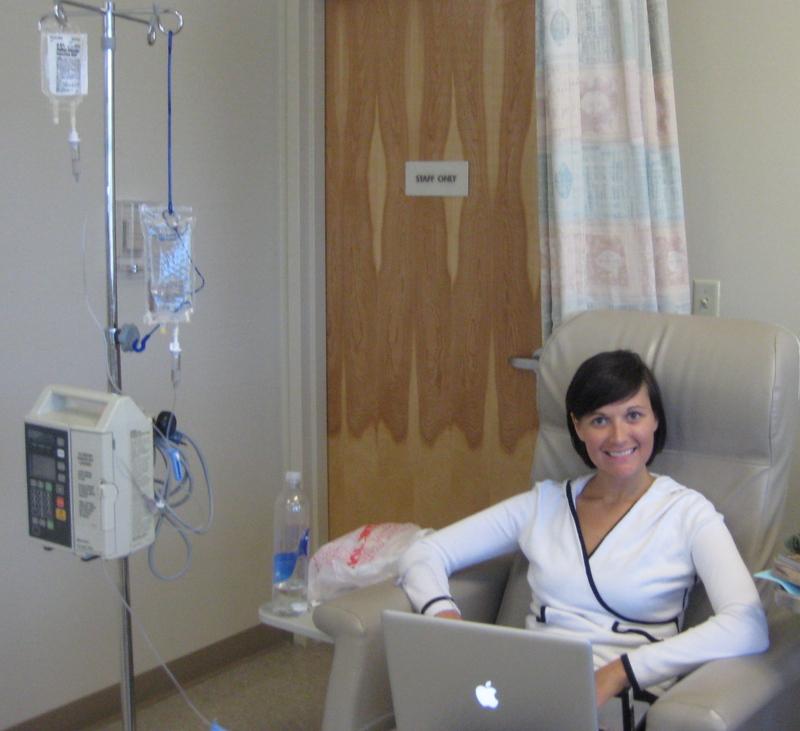 In fact, it doesn’t even seem like I had chemo at all today. The only side effect I experienced was a numb, tingling feeling in my hand half way through the process. The doctors noted this may not even be an effect from the actual chemo drugs, rather a result of having an IV in my hand for an extended period of time. Basically it feels like the tingling sensation you get when your arm or leg falls asleep, times ten. Regardless, I’ll take this over some of the other potential effects one can experience. After chemotherapy, I had an appointment with the radiation oncologist and they proceeded to run some CT scans in order to accurately map out my upcoming treatment plan. I didn’t begin radiation treatments today, but will start tomorrow afternoon. There was one part of this process I wasn’t prepared for. Up until now, I’ve maintained a clean canvas of virgin skin – sans tattoos. That changed today when I received four of them. Albeit small (size of a ball-point pen head), they are now something I will have with me forever. These tattoos will help serve as a guide for each of the 28 upcoming radiation appointments I will have. One is located on my lower back, one in the middle of my back, and one on each side of my upper thigh. They will make certain my body is accurately positioned every time so the radiation beams are targeting the appropriate area. Once I begin radiation tomorrow, I will continue it daily, Monday-Friday, for 5.5 weeks. It is estimated that each appointment should take no more than fifteen minutes. More on this experience tomorrow. Go Team Em! This is only the first of many shutouts to come! Thanks for your great writing and keeping everyone informed about your progress. We are surely praying for a good outcome for you! Keep up that terrific smile. You are precious. Emily…..we r all thinking about u here in Minnie….what a tough cookie!hang in there! WOOHOO! Good for you! Your description is a familiar one, though you have an edge on Michael. His chemo center doesn’t have wi-fi OR cable tv, so it’s a long five hours for him! Clearly you are a beacon of positivity and it is hard not to be moved by your spirit. Keep on truckin! We are all right behind you girl! Hey Em! I just want to tell you that you are amazing and brilliant and this thing does not stand a chance against you! You are much too strong! Your humor and passion really shine through in your words and it is so inspirational. I hope you know that if I can help in any way I absolutely will! You just let me know. Andrea shared your story with us and we have been reading your blog. You are incredible Emily and one very strong, spirited woman with a great writing style by the way. Please know that we are thinking of you, and wishing you the best. Congratulations on the upcoming marriage. He sounds like a great guy! WITH A RECORD OF ATTACKS, GREAT ROUND 1! MY MONEY IS ON YOU TO KNOCK OUT “UGLY C” EARLY! YEAH EM! We are with you! We appreciate the updates but also respect the need to be unto yourselves. Just know you two are in our thoughts.